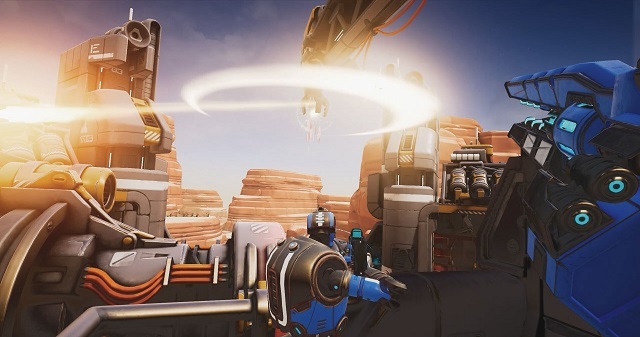 I was given the chance to be one of the first people to play Sol Raiders, a free-roam VR PvP shooter, and this is what it was like. 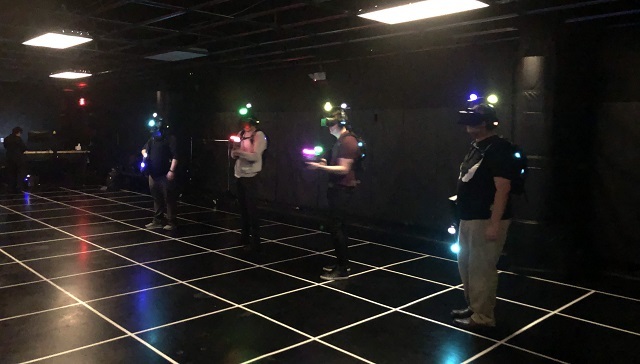 I recently had the opportunity to give free-roam VR a try at the Zero Latency Virtual Reality experience at the MGM Grand in Las Vegas. Zero Latency creates multiplayer free-roam VR game experiences at locations worldwide. 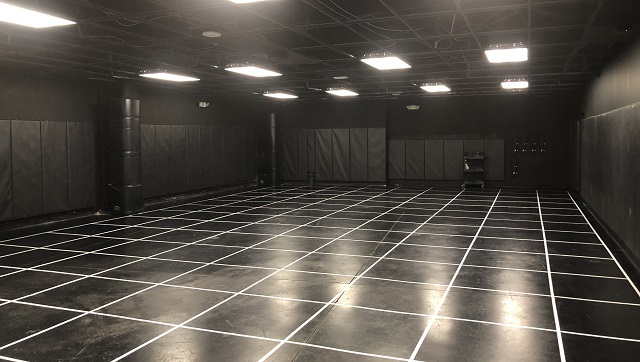 Free-roam VR puts players in a large room marked with grid lines that evokes thoughts of a Star Trek holodeck. Each player is given a backpack that holds a computer in it to which their VR headset and headphones are connected. This leaves players free to roam about the gaming space without being encumbered by wires. If you've played VR games at home before, then you know that movement in those games can be awkward or jerky and often make use of unnatural constructs like teleport leaps. In free-roam VR you move by moving, walking to where you want to go. It's not uncommon to feel a little woozy or lightheaded when playing a VR game at home ' your body doesn't get the sensory feedback of motion that you're getting from your eyes. With free-roam, though, you're actually moving in the real-world as you are moving in the virtual one. I never once felt dizzy during the four hours I spent playing free-roam VR, a length of time that I could never play VR at home without making myself ill. The VR headset will help you to avoid running into another player or a wall by popping-up proximity warnings on your HUD that show you where other players are physically located in the real world when they are within a certain radius of you, and by projecting red virtual walls that let you know that you're getting close to a real one. For shooter games you're given a large plastic gun with a working trigger, pump-action grip, and other buttons. Previously available games have all been co-operative. The non-violent Engineerium lets a group of players walk through a surreal world together, navigating twisting walkways that will make you think that you've walked into an Escher print. Outbreak Origins is a zombie apocalypse game that has players moving from one zone to the next to fight off waves of zombies in horde style gameplay. The Sci-Fi inspired Singularity has you battling the robot defenders of a rogue AI in a mix of horde mode and rail shooter style play that ends with a multi-round boss battle. Zero latency's latest game, though, is a departure from all of these, creating a full team-based competitive multiplayer experience. While the new game, Sol Raiders, has only just been revealed to the public, I was lucky enough to be one of the first to play the game before it was publically announced. Sol Raiders is played in three rounds on three different maps. The gameplay on each map is objective-based, with the team scoring the most points within a set time limit winning the round. Kills are tracked, but only contribute to a team's score in the event of a tied objective score. Of course, eliminated players can't help their team score until they respawn, so kills are still an important part of the game, too. The game supports up to eight total players at a time, divided into two teams. 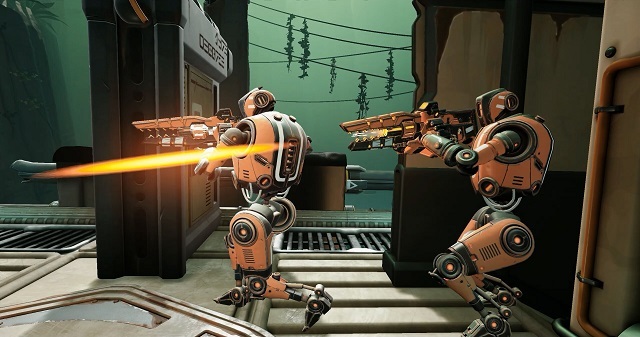 Your weapon has two modes of fire, working as both an automatic laser rifle and a shotgun. Pulling the trigger fires the laser bolt, and while you don't have to reload your weapon you can cause it to overheat if you try to fire too rapidly, and if it does overheat you'll need to let it cool before you can fire it again. The shotgun causes a lot of damage at short range, and to use it you must pump the weapon before pulling the trigger. There's also a button on the side of the gun that will bring up a HUD showing the current game score and stats. The game can track your weapon position and your stance, so you can fire from cover, duck behind obstacles, or fire around corners. Each player can take some damage before being killed, but once fragged you become a ghost and must make your way back to one of the respawn points that appears when you die. Once you reach one of these points you're back in the game. The first map is called Turbine Station. Teams begin on either end of the map, and there are two outer lanes that lead to a small central open area with some cover at either end. A rail runs above the center of the map from which is suspended a large orb. Aiming your weapon at the orb and holding the trigger will emit a beam that pushes the orb toward the enemy's side of the map. The more weapons you train on the orb, the faster it moves. If one team pushes the orb all the way to the enemy's side of the map, they score a point. Players then return to the starting position and the orb is reset. Turbine Station is a map that keeps you in the action for the entire round. The spawn points are relatively close to the center of the map, and you'll quickly run into enemy fire if you're not careful. Teamwork is important here, as you'll need to watch for enemy players coming from four different entry points while also focusing on getting beams onto the orb. This map also has an interesting feature in that you must move up a small ramp as you exit the starting area. The first time you step on the ramp it will be a little disconcerting as your body will expect your next step to land higher than the last, but since you're walking on a flat floor this obviously doesn't happen. You'll be able to mentally adjust to this sensory disconnect pretty quickly, but the first time you walk up the ramp it will feel pretty funny. The second map is Dark Wreck, and it features room-to-room fighting in close quarters. A data canister will randomly appear in one of the rooms and players must make their way toward it. The small rooms on the map are all separated by doors which can be temporarily opened by firing at the panels on the doors. When you reach a canister, you must train your weapon on it and hold the trigger down to download its data. When one team downloads the data, they score a point and a new canister appears elsewhere on the map. Playing this map is all about flanking ' moving through the rooms and opening a door to catch your opponent from the side or from behind. This can be especially satisfying when you come up on a player focused on the data canister. Hit them with a shotgun blast that they never saw coming and then download the data to score one for your team. The final map is Mining Canyon. On this map, each team starts in different tower overlooking the canyon. From there you can either ride an elevator up to one of two sniper positions, or ride one of two gondolas across the canyon to a station on the other side. The station opens into a room with several doors leading outside, and outside is where the objective lies ' an orb on a rail similar to that in Turbine Station, but that sits horizontally at the same height as the player. Move the orb to your end of the rail and your team scores a point. Unlike Turbine Station, though, players don't have to return to the starting area after each point is scored. This map gives you a mix of long-range and close-in fighting. Players in the towers can provide overwatch for those moving in to score, calling out incoming enemies and sniping them when they try to move into the open to push the orb. Snipers will also have to keep an eye on the other towers so that they won't get picked off by enemy snipers themselves. The inclusion of the towers and gondolas on this map give you the illusion that you're playing in a much larger space. That player that you're trying to hit from 50 yards away may actually in reality be only be 5 yards away from you. Taken together the three maps provide for a good variety of shooter action and provide teams with the opportunity to use different tactics. 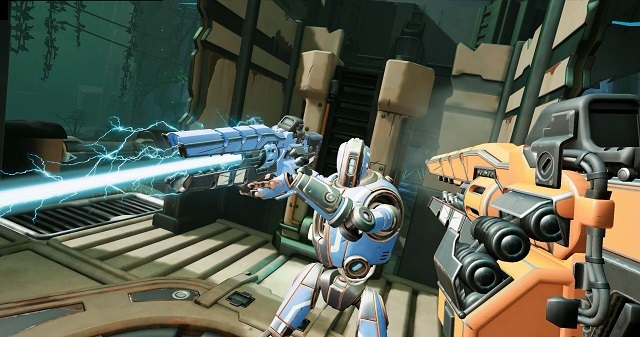 I can see gamers forming Sol Raider teams to play together and the potential for this to lead to tournaments and even eSports leagues, a path that is very much a part of Zero Latency's vision for the game and free-roam VR PvP play. The company sees Sol Raiders as the beginning of a game that will evolve, with the potential for larger teams and new, more complex maps in the future. I had a lot of fun playing Sol Raiders. The first time through was a learning experience as I got used to the feeling of walking through a virtual world, a feel for the weapons, the game objectives, and the map layouts. Once I got my feet wet, the game was even more enjoyable as I felt comfortable with moving through the VR world and was able to focus on my tactics and gunplay. It really is a completely different experience to actually be in the game, holding a rifle, and moving around on your own than it is to be sitting on a couch with a controller in your hand. 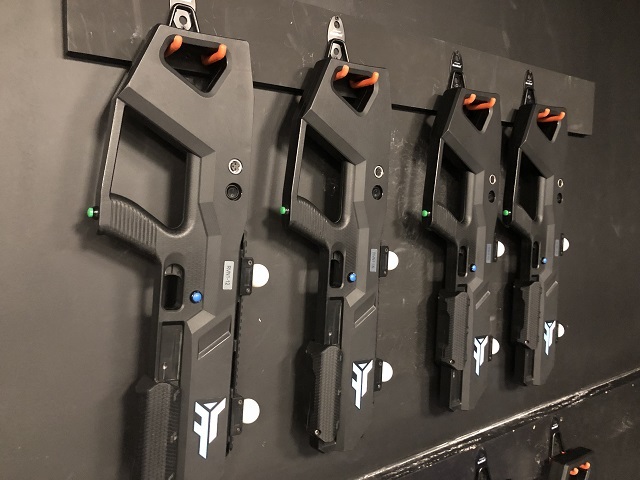 If you have a Zero Latency venue near you, or are near one on your travels, I highly recommend that you give Sol Raiders a try (and bring three friends with you if you can). Not only will you have a great time, if you find you're good at it, then you just might have a future in eSports when pro gaming enters a new dimension.